On October 16, 2014, DAWN-RAFH Canada’s president Carmela Hutchison spoke at a press conference in Ottawa in which she announced that the organization would be joining the Canadian Union of Postal Workers (CUPW) in launching a federal court challenge against Canada Post’s decision to end home-mail delivery. In her presentation Ms. Hutchison outlined DAWN-RAFH Canada’s reasons for becoming a litigant in the case. Here is a summary of her statement. DAWN-RAFH Canada is very glad to be in coalition with our partners in this important matter. 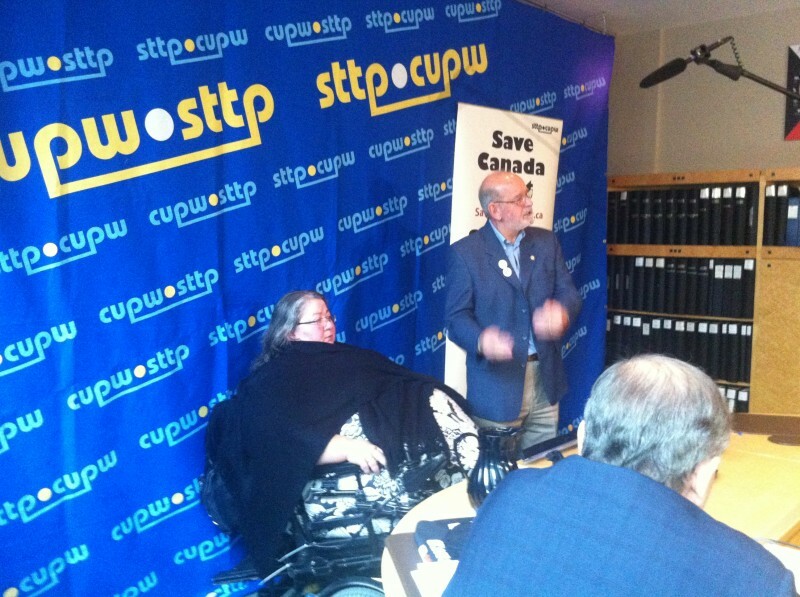 Women with Disabilities across Canada are very concerned about the intention of Canada Post to stop home mail delivery service. Women with disabilities are at greater risk for violence both because they are women and because they are disabled. Ending mail delivery service places all Canadians with disabilities who rely on home delivery service as part of their personal safety plan at risk. The risks posed to women with disAbilities comes from two directions: one because we are women and the other posed by our disability. Difficulty reaching the boxes, uneven or icy terrain, inability to hear someone coming if you are deaf or hard of hearing, inability to read your box number because of vision or disability, all place us at risk because we are forced to travel a path to a box in the community. Such routines make a point of risk of further abuse to us. Women who have more severe disabilities are then also placed at even greater risk if they are forced to allow others to collect their mail. One woman actually had a trustee because she could not get her own mail because of the severity of her disabilities. Resorting to caregivers or family members is, on the surface, what should be the logical solution and the problem seemingly minor. It is anything but minor when you are a senior or a woman with a disability and you are being stolen from by your caregivers, or financially abused as a senior. There is no expectation of privacy when other folks can get your mail. One woman living in an area with a community mailbox had tenants who did not conduct themselves well. While she was away from home, her mail was tampered with for months. Economic challenges can create risky situations as people try to improve their situations by sharing housing. The inability to have observation and control of the box through residential delivery again increases the risk to women with disabilities. Women with disabilities are also at risk for stalkers or abusers. Women with mental illnesses such as agoraphobia, paranoia or post-traumatic stress disorder may find it impossible to get to the box. Women with episodic disabilities may also experience additional fatigue or pain. If they are injured, they may become continuously disabled. Women with hidden disabilities such as depression, heart disease or COPD may look well, but be unable to manage the trek each day. Loss of postal delivery service removes an important link in the chain of safety when the postal workers who deliver the mail would notice people were unusually absent or could see someone had fallen or was injured. These fine public servants will no longer be on their routes. In addition the introduction of “accommodation” now becomes a huge problem for both the women with disabilities and the postal service. Do we put a big handicapped sign on the door? Who approves it? The Canadian Medical Association wisely indicated it would not. The payment for these types of reports can be an economic barrier. The amount of paperwork, complexity of paperwork and the frequency have caused some patients to lose their doctors in an era where it is already very hard to find a doctor. Municipalities do not want the boxes on their boulevards, nor do they want the maintenance. One woman has been told that Canada Post would actually place the box by her home – unless of course even one neighbor complained! Article 6 (women and girls with disabilities are at greater risk for poverty and violence); specifically Article 9 (1:b & 2:a, b, d)(Accessibility); Article 19 (Living independently and being included in the community); Article 21 (Freedom of Expression and opinion and access to information); and Article 22(1) (Respect for Privacy). If services are discontinued, we endorse the Council of Canadian’s with Disabilities’ position to simply decrease the frequency of home delivery. We call on the government of Canada to uphold its commitment to the rights of Canadian women with disabilities as set forth in the Convention on the Rights of Persons with Disabilities.